My husband is out of town this weekend and, on the rare occasion that happens, I like to have my girlfriends over for some great food and a chic flick. Picking a movie is never the hard part. The hard part for our girl's night is "What are we going to eat?" We are all foodies, and are always wanting to try new things. Well, tonight's main course inspiration came from a mid-week luncheon I had with my friend Melissa. We were eating at Olive Garden, and opted for their Zuppa Toscana instead of the salad as the opening course to our meal. As I was eating the soup I said to her, "I could so make this at home, we should make this on Thursday!" Of course, she was totally amicable to this idea, so I began picking apart the ingredients on my palette. (I secretly love a good challenge like this!) Then it was off to the store to purchase a couple things I needed. Well, here we are, Thursday, and I have to tell you...I NAILED IT!! The flavor was spot on and it was delicious! Best of all, it was easy! I can't wait to share my recipe with you, so let's get started! To begin, place your Dutch oven over medium high heat and add olive oil. Once your pot is hot, add your onions and cook until soft and translucent. Next you will add the garlic. Cook the garlic until you can smell it coming from the pot. Let the sausage brown and cook all the way through. When it is finished cooking, remove from pot and set to the side. Now it is time for the stock. or, maybe a chicken purchase is not in the budget. After you have added your stock, let it come to a boil. to prep your kale and potatoes. Cover the pot and let your soup simmer for 10 minutes. This will allow the kale to wilt and cook. Look at that! 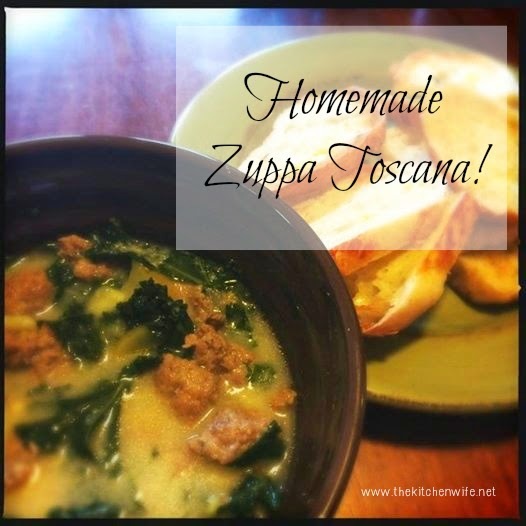 Zuppa Toscana that YOU MADE in YOUR HOME!!! and life just doesn't get any better! Inspiration for great food is all around us! We just have to open our pallets, and our minds, be willing to take risks, and reap the rewards!!! Now get in your kitchen and try something new!!! Place the Dutch oven over medium high heat and add oil. Place onions in pot and cook until soft and translucent. Add garlic and cook until you smell the garlic coming from the pan. Add sausage and chili flakes. Add chicken stock to the pot. Using a wooden spoon, scrape brown bits from the bottom of pan. Bring to boil and add sliced potatoes and kale. Allow potatoes and kale to cook for 10-15 minutes. Add cream to pot, stir, and taste for seasoning. Ladle into a bowl, top with parmesan, and ENJOY!